Let’s take a second to dream up our perfect pair of leggings. A pair we never want to take off. A pair we can wear endlessly because they go with everything and because we want to. And most importantly, a pair that people won’t judge Us over if we want to wear them somewhere other than the gym or while sinking deep into our couch cushions, buried in blankets. Okay, time to wake up, because we have a surprise: This pair of leggings exists! And they are currently buy one, get one 50% off! Hue’s Women’s Original Denim Leggings are the answer to our dreams, and all we want is to ask them if it hurt when they fell from heaven, but maybe it’s better if we don’t. We don’t want to ruin this beautiful new relationship with a corny pickup line! See it: Grab the Hue’s Women’s Original Denim Leggings (originally $44 each) for just $33 each when buying two pairs from Macy’s. Offer ends January 27, 2019. The details of these leggings are so specific, no one will ever do a double-take when they see us in our new “jeans,” unless they’re wondering where we got them, of course. Faux pockets in the front will fool even the sharpest eyesight, and there are patch pockets in the back! Seam details are where we’d expect them to be on any pair of skinny jeans, as is the zipper, even though it’s thankfully a fake! We’d rather not ever have zippers on our leggings, unless they’re adding a unique, fun detail, thank you. The texture of these leggings deserves its own star on the Hollywood Walk of Fame. We zoomed in as far as we could on the photos and still couldn’t make out anything other than denim. We considered buying a magnifying glass for double the zoom, but then we decided we were going a little overboard to prove a point that’s already been proven. These leggings are denim in every sense of the word except for the actual fabric. Know how these leggings are currently buy one, get one 50% off? It’s the perfect deal, because they come in six amazing colors. They are Hue leggings, after all. The Black shade is a tiny touch above a true black, which helps to show off the texture. If we’re looking to get as far away from the black leggings look as possible, we can also choose the White shade instead (or get both and get the deal). Both shades can be paired with practically anything. Ah, the elegance of monochromes. Want to go for a more traditional denim look? Two shades of blue are available! A true blue jean shade called “Medium Wash” is the go-to for all casual outings. For something a little fancier (or if darker clothes are more our style), there’s also a Midnight Rinse shade, which is a night-sky color on which the texture imitates stars galaxies away. Are these space pants? Because they’re out of this world. Okay, we promised no bad pick-up lines. These leggings also present a great opportunity to try out new colors in comfort, with two untraditional jean shades. Olive is a gorgeous, calming shade of green. It’s brighter than army green but way more understated than a Kelly green. Earthy colors like this are easy to find matching tops for and we’re excited to try some out. We like the idea of a cream blouse and a leather jacket, for starters. Red is a pure, fire-engine red. It’s loud, it’s bright and it’s iconic. Only wear these if prepared to stun! Which we always are. Just let Us finish our morning coffee first. Shoppers can’t get enough of these denim leggings. One raved that the leggings “have everything good going for them,” while another pointed out one of those numerous good things, which is that even after a wash they still look brand new, maintaining their skinny fit from hip to ankle. There’s nothing like slipping on a clean pair of leggings that look just as good as they did on day one. Just make sure day one is soon, because this BOGO 50% off deal ends on January 27, 2019! 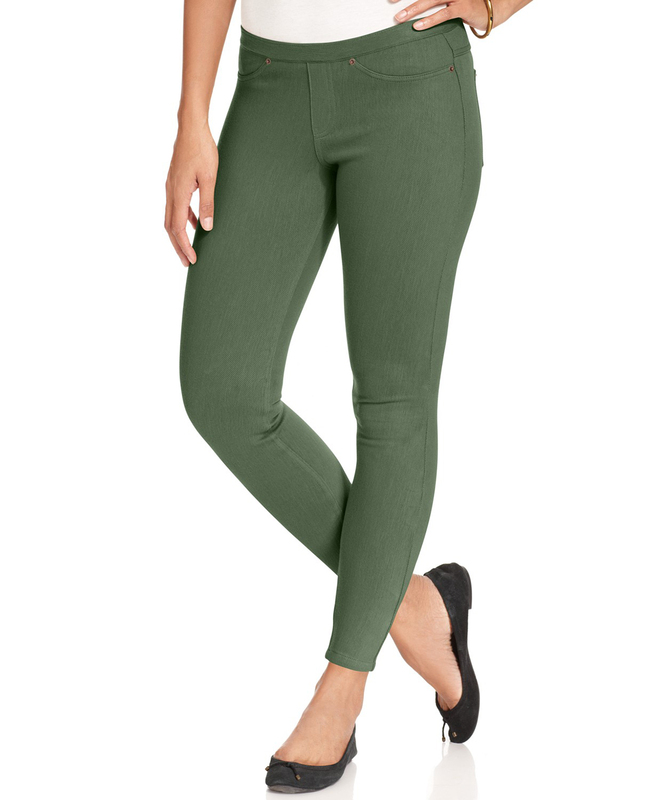 See it: Grab the Hue’s Women’s Original Denim Leggings (originally $44 each) for just $33 each when buying two pairs from Macy’s. Offer ends January 27, 2019. Not your style? Look through more leggings from Macy’s here!